Good food can do wonders. No surprise here. It can make us happy, healthy, and more productive. If you find yourself distracted and if you can’t focus at work or at school, all you have to do is eat the right food. The foods we list below have the ability to increase your mental focus as well as improve your mood, memory, and clarity. 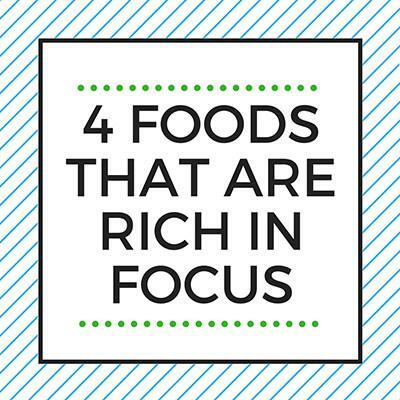 So what are the foods you should eat to have better focus? Below are four of them. Most variants of chocolates are tasty but let’s skip the sugary, milky kind, shall we? A small amount of dark chocolate (yep, the semi-bitter one) has a small amount of caffeine that can increase your mental alertness. Aside from caffeine, a small amount of dark chocolate also contains magnesium, which stimulates the release of endorphins and serotonin. When these body chemicals are released, they will make you feel good and heighten your mood. Nuts and seeds are a great source of Vitamin E, a powerful antioxidant that has the ability to regenerate and repair body cells. Consume just an ounce of nuts a day and you will reap the benefits. Apart from Vitamin E, nuts are also rich with amino acids, manganese, and essential oils that can help with your focus. And last but not the least, one food for better focus is blueberries. This sweet, juicy fruit can boost your concentration and memory for more than four hours. Why is that so? Blueberries have a concoction of antioxidants such as tannins, anthocyanins, resveratrol, and proanthocyanidins that have been shown to increase focus and even fight cancer and heart disease. The nutritional makeup of avocados make them great at increasing blood flow. The more blood flow our organs have (especially our brains), the better and more efficiently they function. An added bonus of avocados is they are packed with fiber – making them a food choice that sticks with you longer, keeping hunger away. Do you want to drink something invigorating? Have a cup of green tea. Aside from caffeine, it contains l-theanine. L-theanine is an ingredient that’s been shown to increase “alpha-wave activity” that is said to make you calm and focused. If you have no problems with caffeine, then this food for better focus should do the trick for you.